Note vibrates abnormally. Violin broke? The photos are of an old bow that I have. The question is about what I assume is mother of pearl on the eyes, the adjuster, and the slide. I've never seen a bow where the MOP looks somewhat primitive like this. Is that just an indication of the age of the bow, or just amateurish workmanship? Since it is somewhat unique, is it worth having the MOP repaired when I get the bow rehaired? I've never had this bow rehaired, so I'm not sure if it's a good player or not. In fact, i'm not even sure it is worth rehairing, but just curious about the MOP. Thanks. I've recently repaired a couple of Srentor cellos with broken necks for a local music store. They were not broken completely off, but were retained by a small rectangular piece of wood inserted vertically through the neck. Made it easy to locate and glue. Easy repair with a couple of dowels. I am building a violin and wondering about drilling the neck at the heel and installing a dowel as reinforcement, possibly preventing a future break. Maybe that has been done before. Maybe it's overkill. What do you think? Thank you! Just wondering what would be a good plan of action... I was given an 'old violin' and took it to a specialist string store to get looked at. Told it was definitely worth doing up (for my daughter). Took a couple of pics of instrument and label inside (best as I could) before taking it in. Got it back and the identifying label inside has had the middle third of it all scratched away - gone! The repairer made no comment to me about this when I collected the instrument and I feel so angry about this. Also, the wood under where the label was seems very roughly scraped. Would it be possible this was already like that- or unlikely? After speaking to professional players, noone seems to understand why this would have happened...and more over why it would not have been mentioned. The violin is a Strad copy, so not ridiculously wonderful instrument, but still good. Should I be concerned about this? And if so, what would you expect to be done about it? I'm assuming the part of the label that is missing is long gone.... I hate confrontation and I guess I'm thinking nothing can really be done about it anyway. Thanks for your opinion. I'm not a string player myself, but am a School Music teacher, so I do know a few bits and pieces. Cheers. 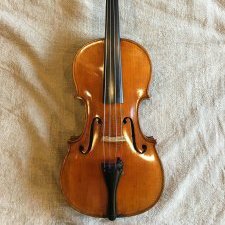 £29.99 violin #2 To repair bow or dump it? The bow that came with my budget but old violin needs a rehair but also a replacement tip. It's seems to be a decent quality bow so is it worth paying the amount required to set this up for future use? Is it old or just used a lot - leather pad has perished somewhat? What material was used for the metal the internal metal parts? Looks like gold but surely not? Happy new year to all! I recently picked up a bow stamped "Grimm" and "Germany" that looked pretty good and I thought it might be a good playable bow for the price ($45 plush shipping), although it needed a little bit of work. It needs to be rehaired, needs new windings and a new grip. Now, I grew up in Spokane, Washington and there was a guy there who did excellent work on both violins and bows - he studied at several places, including some in France, and just did a marvelous job. His prices were great, too. I guess I got spoiled. Now that I'm down here in Naples, Florida I thought I'd check about getting the bow finished up at the local shop that does in-house work (with a luthier on-site). I figured it would be around the same prices.... and was literally speechless when the guy who looked at the bow was clearly completely uneducated about violin bows (and I'm no expert, so if I'm saying that it's pretty bad) and he wanted to charge $450 for a rehair, windings, and a grip! He then proceeded to insult my bow and tell me I was better off to buy one of the "beginner bows" they sold there, which (no surprise) were crap. Including fiberglass (which I am trying to upgrade away from). He told me that he personally had "no idea what [a stamp] means" when I mentioned offhand the stamps on it, and completely missed seeing them in his all-of-5-second inspection that he did right in front of us in terrible lighting. After speaking with him for awhile it became clear that he didn't play or know how to either, which concerned me. All of this together was a little alarming to say the least. I will clearly be shipping my bow to Spokane to the person I'm used to seeing about bows and violins, as you probably guessed. Just to put things into perspective, I got a quote from him while I was on the phone with him, and he said he could do everything for $125, which is a very reasonable price. To be honest, I am glad I'm sending it to him instead.... I trust the work that the guy in Spokane does and I know he'll do an excellent job with this. The joke of a "bow expert" I spoke with today would have probably botched the work if I had mindlessly given him that ridiculous sum of money after seeing how little he knew about bows. I'll tell you what, though. I bet he's sold a lot of crappy fiberglass bows this way. Taking an OT topic discussion from here: http://www.maestronet.com/forum/index.php?/topic/333748-soundpost-press-crack-repair/page-4 I am very interested in the when, why and how of repairing 'cheap' violins. If the option is fix to it cheaply...and use it for one more child, or season (or whatever reason) versus throwing it out because it is not worth repairing "properly"...I would opt to fix it cheaply - provided someone is willing to do the work. I started playing the violin in Grade 5, in a school-sponsored strings program, on a very cheap loaner. I graduated to a second very cheap loaner in Junior High, and then upgraded to my very own VSO which my mother had to save up to purchase for me. If I didn't have access to these cheap instruments...I wouldn't have had the opportunity to develop an on-going interest...which I finally was able to actually explore more fully once I was an adult. I also like to learn from the ground up. What can you do to do a functional repair? What do you use and why? What shouldn't you use and why? And...when is a violin worth a decent repair...and when is a violin considered 'trash' and only worth a cheap repair? Finally...when is the violin really past the point of no return and should be thrown out? A scoop from the attic or just another German fiddle?? Is there a way of salvaging a bow tip that has a crack on the top of the mortise? The tip on the bow is quite nice, and I would rather not replace it. I heard some people put a drop of super glue to close it. Kind regards. Hello all you knowledgeable people out there....I have recently bought an old violin because I liked the back and thought I would hang it on the wall. It is German and what I think is usually described in this forum as "the usual". It came with the top off (not very kindly removed by the look of it) but this has revealed what seems to me a strange repair. The back of the fiddle has been completely lined with wide but thinnish strips of a very soft, pale wood; the sort of thing I imagine a woodworm would go into ecstasies over. The repairer has stuck his label in on top of this. Why would you have this sort of thing put into the violin in the first place? Surely it would kill the sound stone dead and be a source of buzzing forever? I cannot see any damage to the back which it might be supporting in any way. Any ideas?